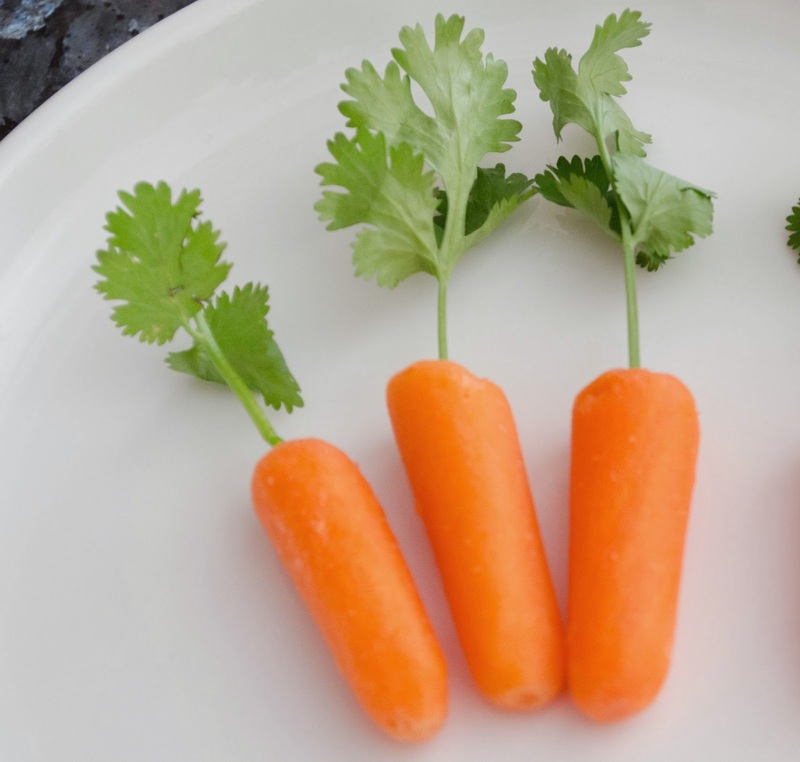 I made this really cute appetizer for Easter brunch yesterday and snapped a few pictures as I was putting it together. 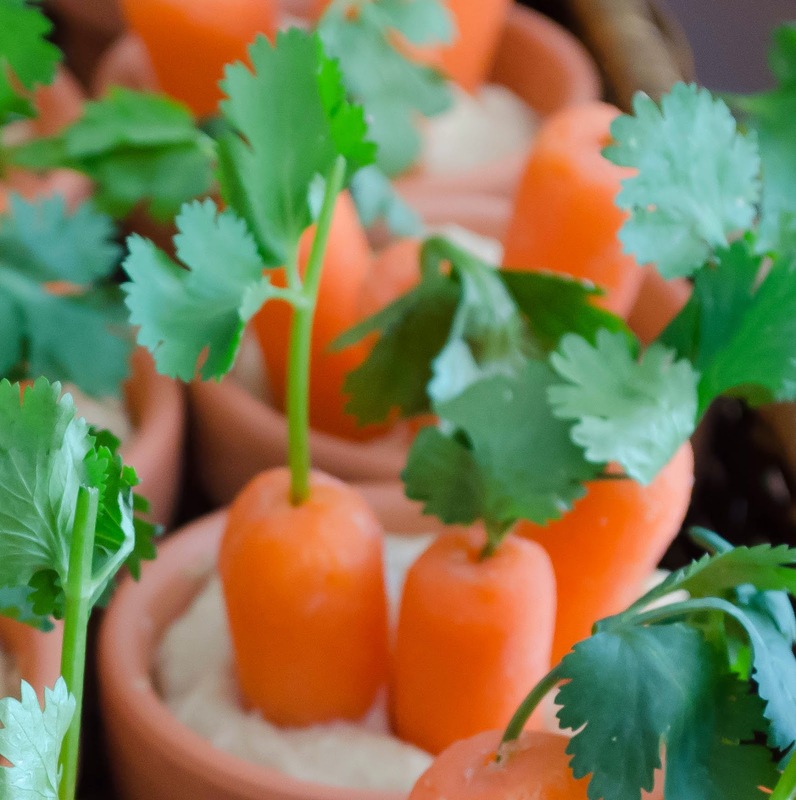 For this project you need baby carrots, cilantro, toothpicks, Dixie cups, and clay pots (very small pots). 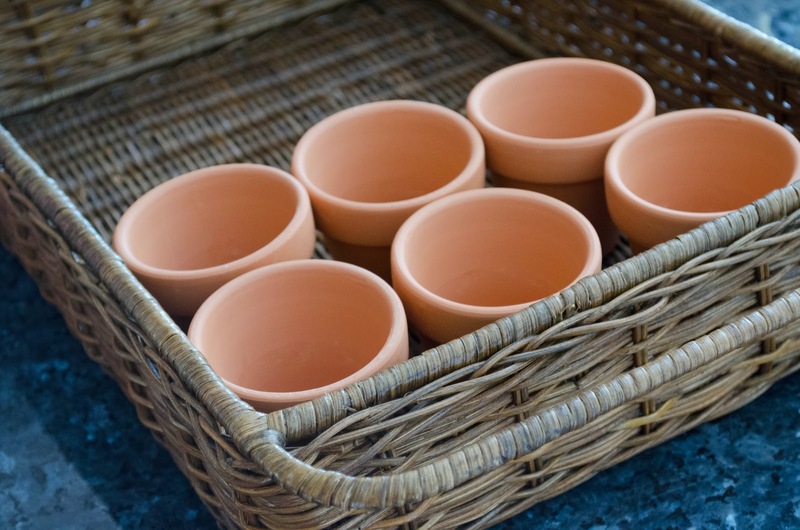 I purchased the clay pots at Hobby Lobby, but I am sure you can pick them up almost anywhere. For the first step, I cut the cilantro into little "stems". I used the toothpicks to poke a hole in the top of the carrot. **be sure that the toothpick comes out and you didn't leave a little part of the toothpick inside. My carrots were really hard, so making a hole took several attempts. 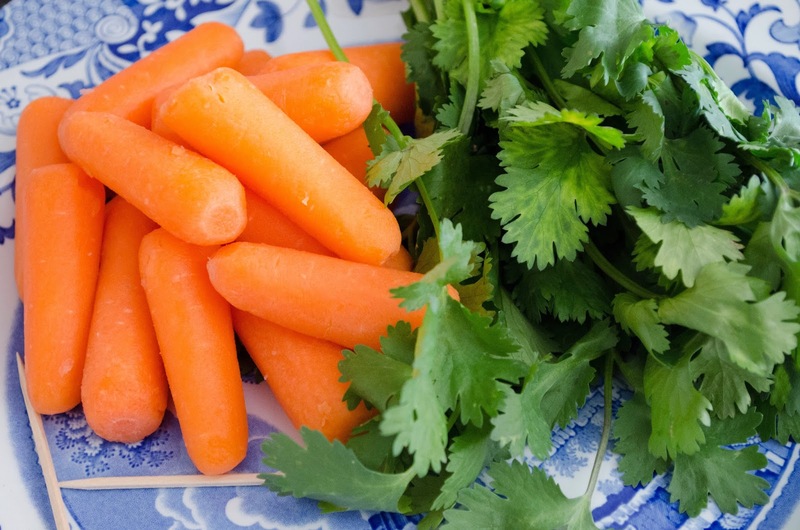 After making the holes, simply place the cilantro into the hole. I used a flat basket to transport the pots in. The instructions called for using a piece of foil over the hole of the pot, but I used a small dixie cup and cut the top off about half way. 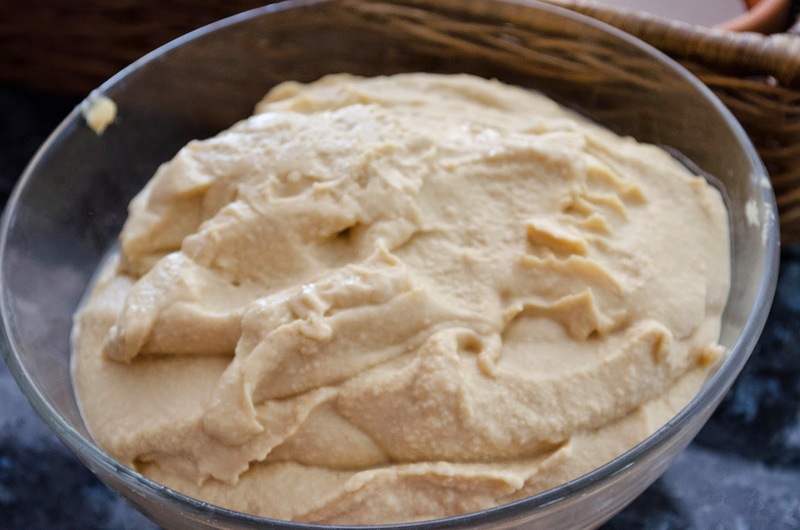 I made the hummus the day before, in my Vitamix. I used 2 cans of garbanzo beans, 1 tbs olive oil, 1 tbs lemon juice, 1/2 cup toasted sesame seeds, and 12 (yes, twelve!) cloves of roasted garlic. This made about 2.5 cups of hummus. 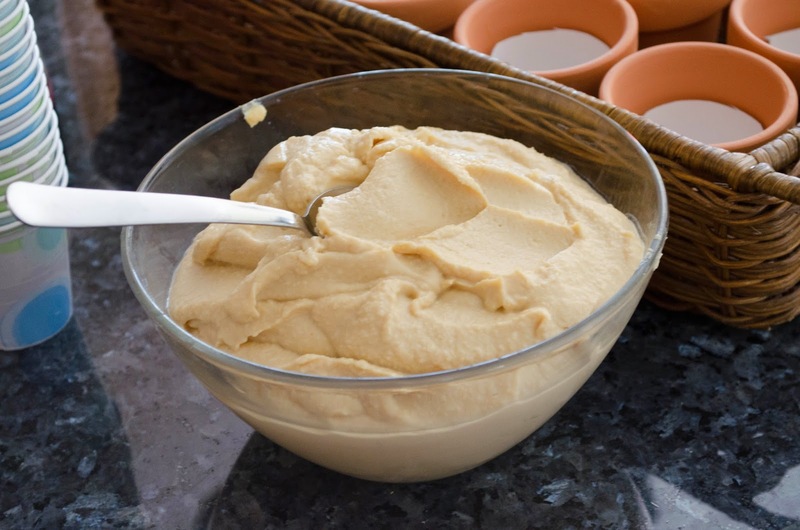 I used a spoon to fill the pots of hummus. I only filled them about half way (approx 3 spoonfuls) because after placing the carrots into the hummus, the fill line rose. I put 3 carrots in each pot, but you can put more if your carrots are smaller. 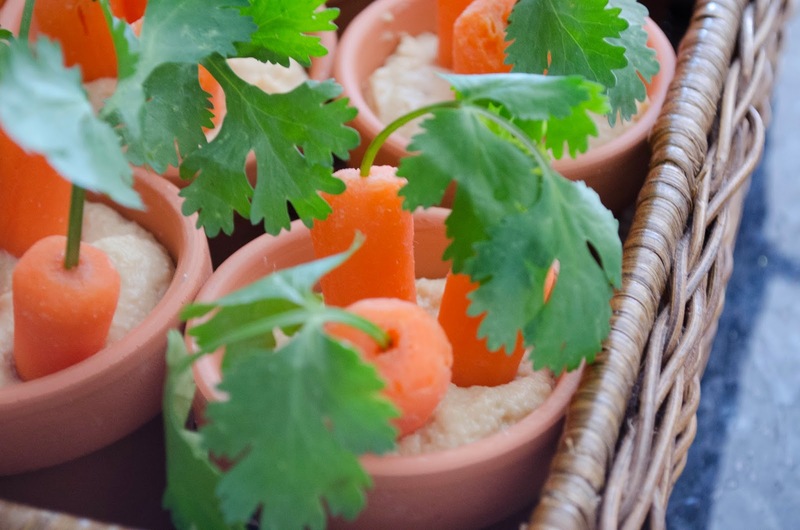 I put all the pots (12) in the basket, along with a bowl of hummus and a bowl of additional carrots. If I do this again, I will not use cilantro, as it started to wilt halfway through the party. I think parsley might have a better chance at staying perky! This appetizer was a big hit, and I only had a few to take home. I found this really cute project on YouTube several weeks ago. I am sure the project is all over the internet since it's so adorable and the instructions are just a click away! I peeked inside my under the bed storage bag, and I saw green! This solo plant is Bells of Ireland. I love this flower! You have to be careful when cutting a flower because there are tiny thorns on the stem, and they HURT! Bells of Ireland are annuals that reseed very well. The picture below are a few blanket flowers. They are a perennial that bloom their first year. 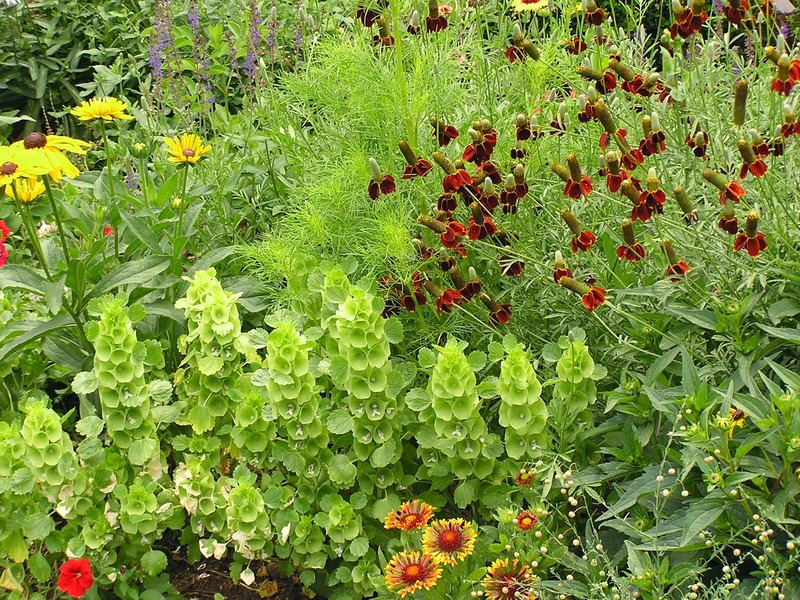 The Bells of Ireland are in the middle of the picture, and the blanket flowers are the orange flowers near the bottom of the picture. Click on the picture for a larger view. 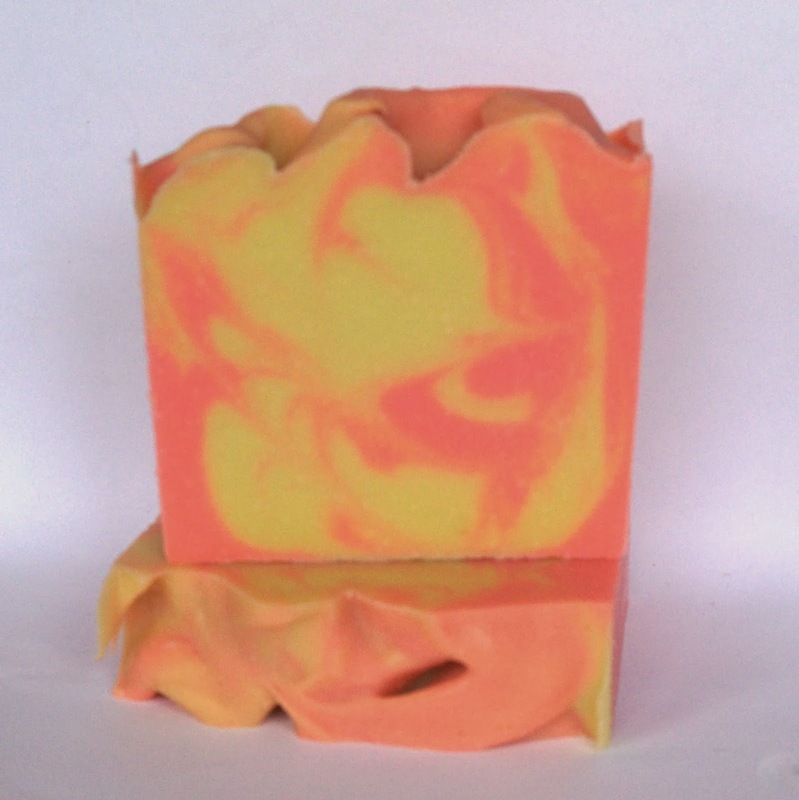 The Final Patchouli Orange Vanilla Soap! The soap turned out great! The brown swirl will darken over the next few days due to the vanilla content. I love the ground vanilla beans in the dark swirl and on top! What do you think? Today I made one of my favorite scents, Patchouli Orange Vanilla! If you have not tried this combo, you MUST! I swear, it is addicting! I used beer for some of the liquid. 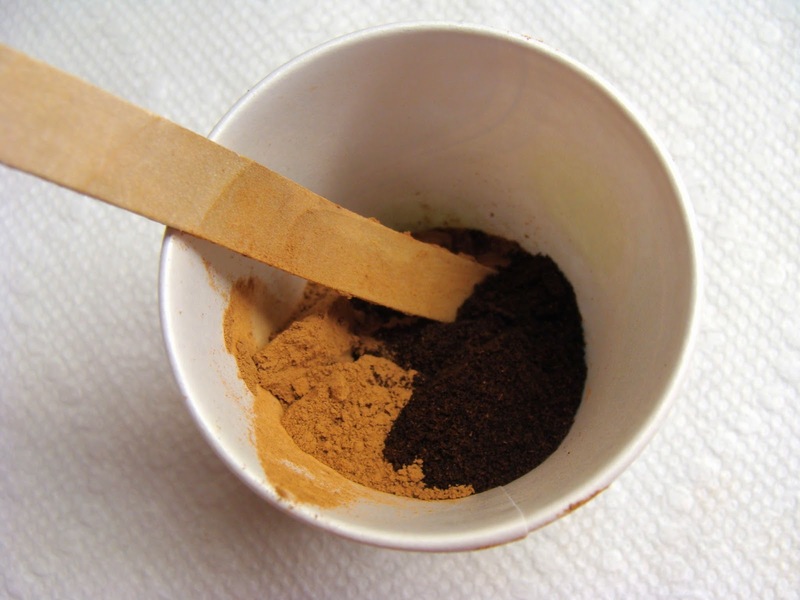 For part of the soap I used organic cocoa powder for color and ground vanilla beans for exfoliation. 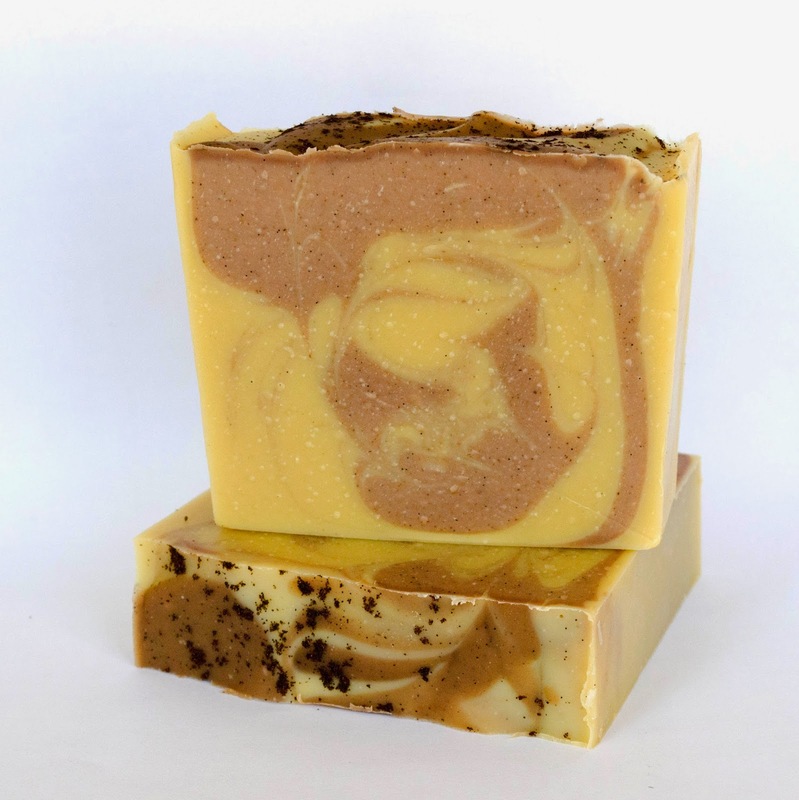 The soap itself will not be too dark, so the cocoa powder will provide some contrast. 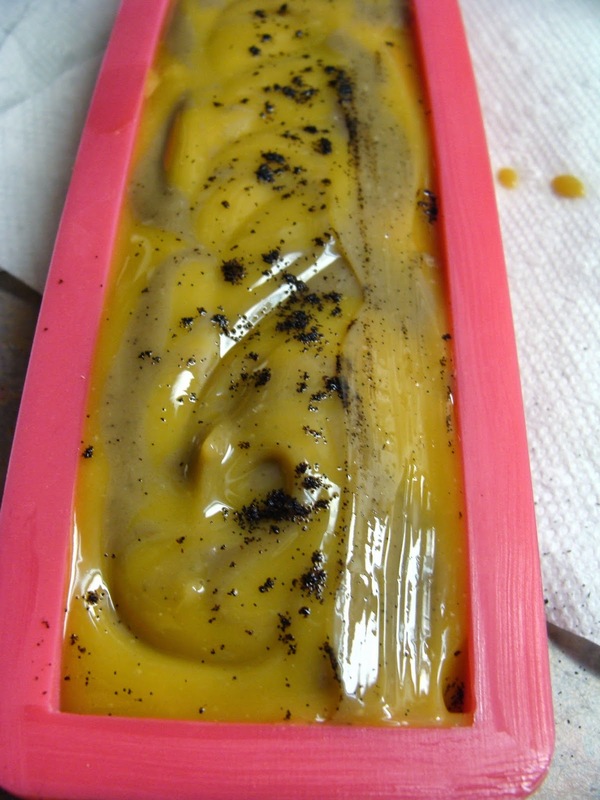 I used dark Patchouli for the blend, which darkens to soap a little. I bought some mixing bowls at the dollar store a few weeks ago. They really come in handy, although they don't handle too much weight. 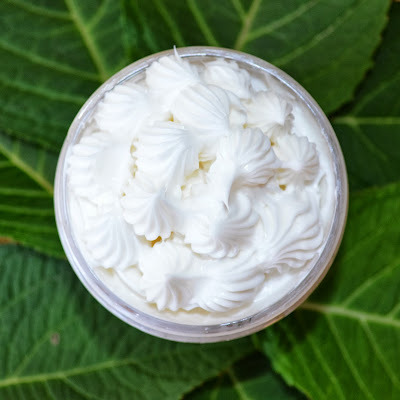 I like to use them to whip body butters, or for mixing scent into liquid soap. Just be sure not to fill them to the top with heavy liquids! I added Bentonite clay to the entire batch. That is what the dark spots are....the clay sinks down to the bottom of the pot. 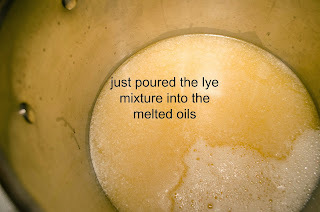 I stick blend the oils and clay together before adding in the lye/beer mixture. I sprinkled ground vanilla beans on the top for contrast. 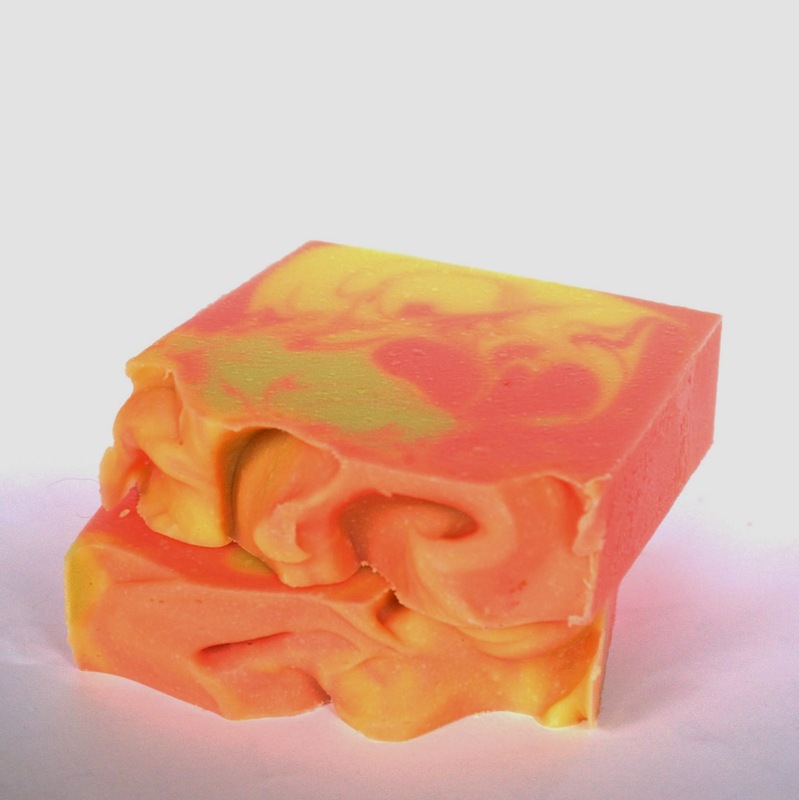 In the above picture you can see the vanilla soap swirled with the patchouli/orange soap. The little mold is for my soap nuggets. 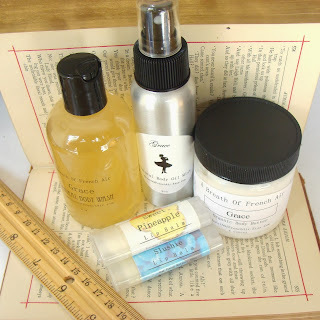 They are perfect for sample soaps and weigh approx 1.3 ounces each. I sell sets of sample soaps in my Etsy shop. Stay tuned for the cut soap pictures! I do believe this will be my 11th year winter sowing! I can't believe I have been doing this for so long, but I guess time goes by quickly. 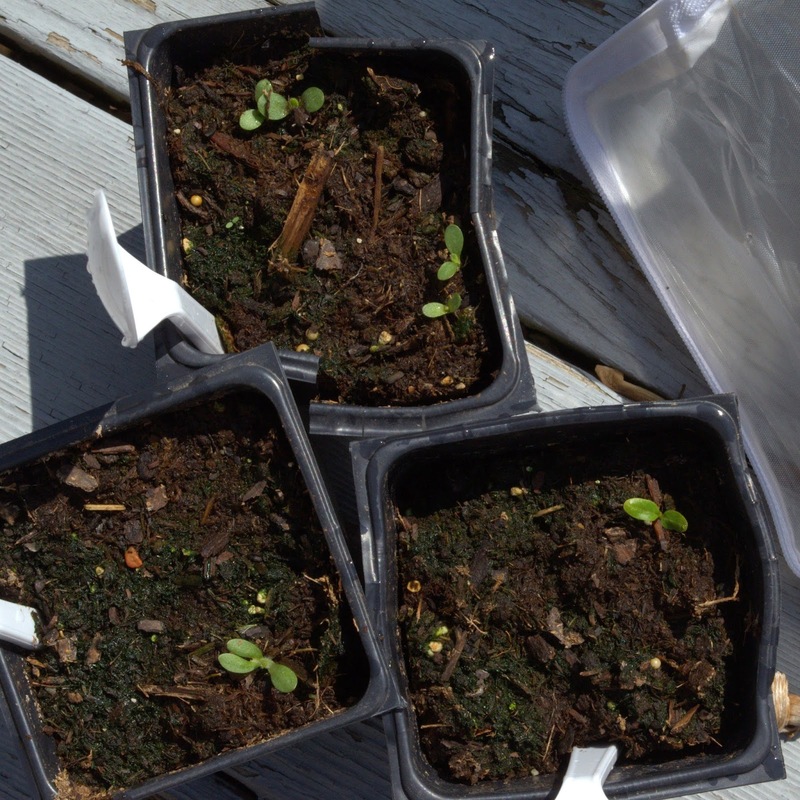 I started winter sowing my seeds in February. We had a few days in the 60's, so I took advantage of the "spring" air. I use both empty milk jugs and plastic pots for my seeds, but I will just show my milk jugs today. First, I gathered all my seeds. Last year I mixed my seeds up, so this year I am being overly cautious by sowing one type of seed at a time. 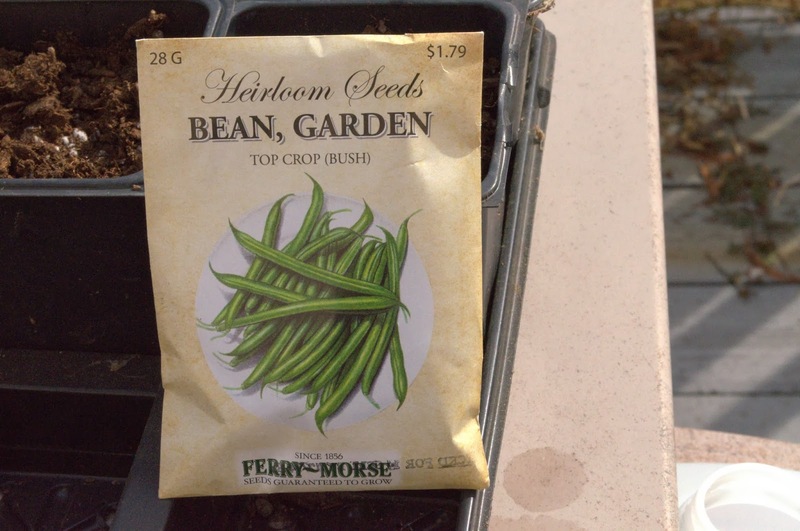 I planted a variety of veggies (cucumber, tomatoes, green beans, peas) and some annuals and perennials. For milk jugs, you need the transparent jugs. They are semi transparent and if you hold a finger to the side, you should be able to see your finger. You want to let in light, so stay away from the solid white jugs. I bought my soldering gun from Big Lots years ago for just a dollar or so. You can find them in most hardware stores. You can tell by my picture that they take a beating. 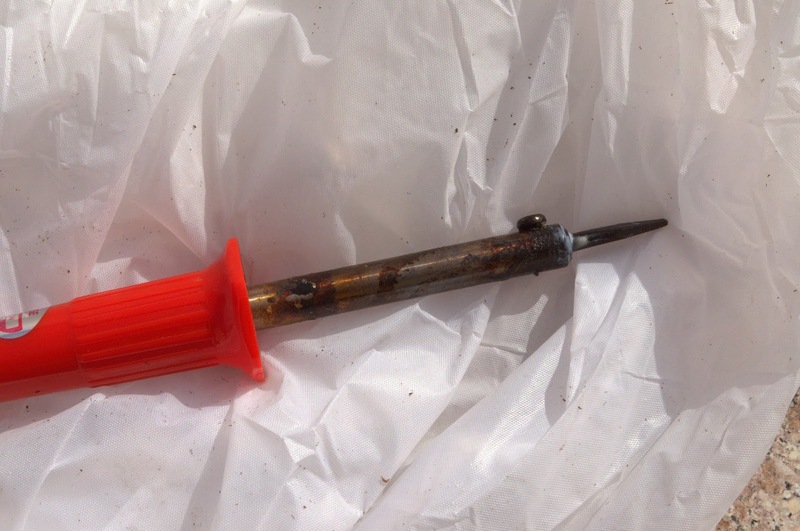 I use my soldering gun outdoors because of the fumes the plastic emits. It really stinks, which is another reason I waited until a semi warm day to do this. You don't have to use a soldering gun to make the holes, but it makes the job much easier. I put several holes on the bottom and a few on the side. Make sure you make a hole next to the handle. This is where you are going to place your scissors to cut the milk jug in half. 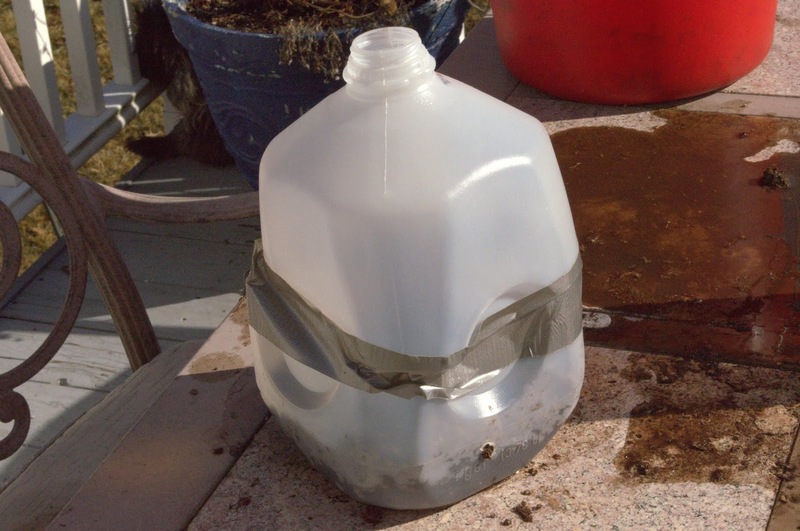 After cutting the holes, use duct tape to mark your jug with your type of seeds. Duct tape will not come off when wet. I use perm marker to write so the ink doesn't wash off. 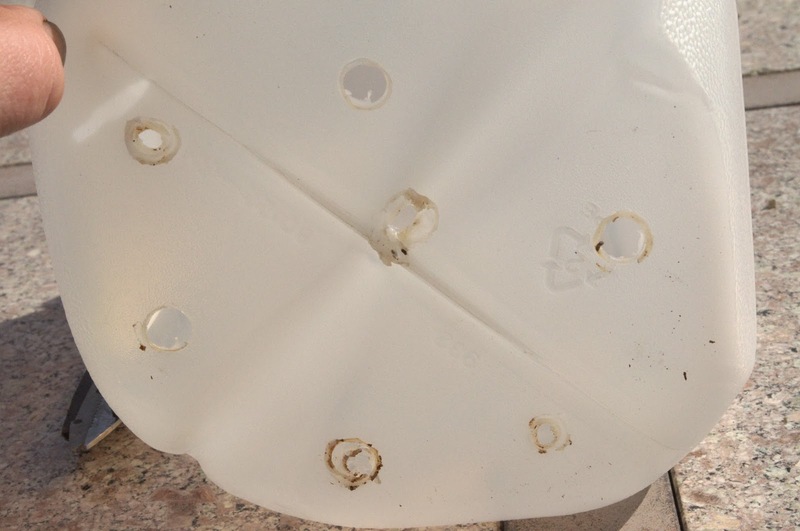 The reason why you mark the bottom of the jug is because the pots will sit outside for several months and in a short time span, the sun will fade the marker and you will be left with mystery seeds! 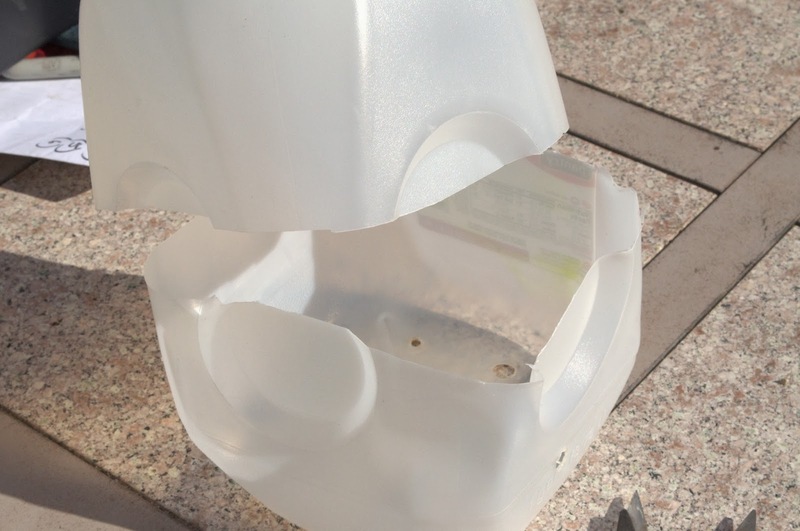 Using the hole by the handle, cut the milk jug in half, leaving the handle still attached. The handle acts as a hinge for the jug. 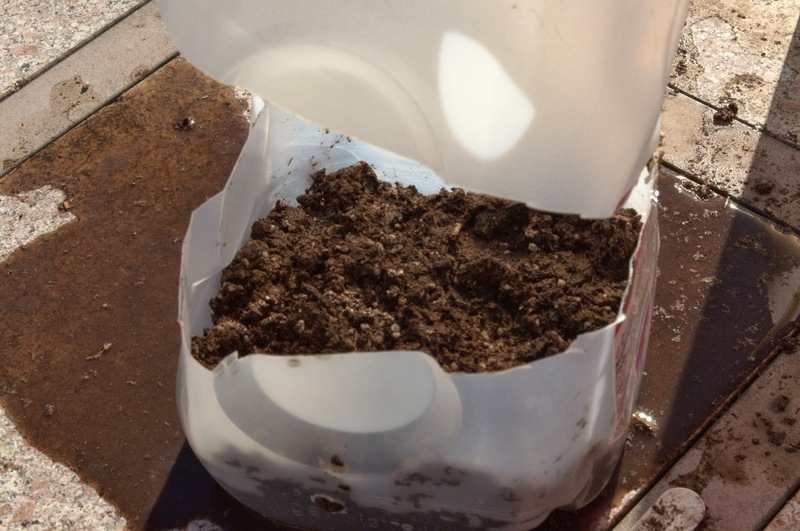 Fill the jug with potting soil and wet the jug until the soil is heavily saturated and water is streaming out the bottom. Sprinkle your seeds on top. You can add a little dirt on top on the seeds if you wish. I found either way works. Using a VERY long piece of duct tape, tape the jug closed. I use several pieces of tape for this. LEAVE the cap off. You will not need the milk jug lid, so you can throw this away. Place your milk just in a sunny spot on your patio or deck. Do NOT place on a table, as wind will blow your jug down. Now, you wait until warm weather visits your area! When it gets a little warm outside, check your jugs for moisture. You don't want your seeds to dry out. When the jug becomes lightweight, use a watering jug to gently spray the soil with water. Below are some pictures using 4 inch pots. I use "under the bed" sweater bags to hold the pots. You can buy these at the dollar store. Cut holes in the top, and bottom, for drainage. 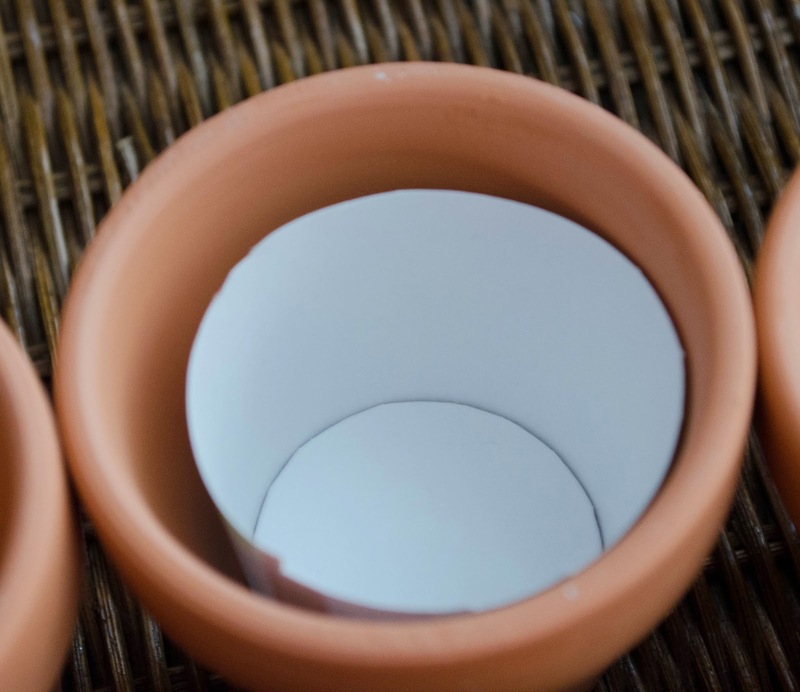 I use tape on the bottom of each pot too. 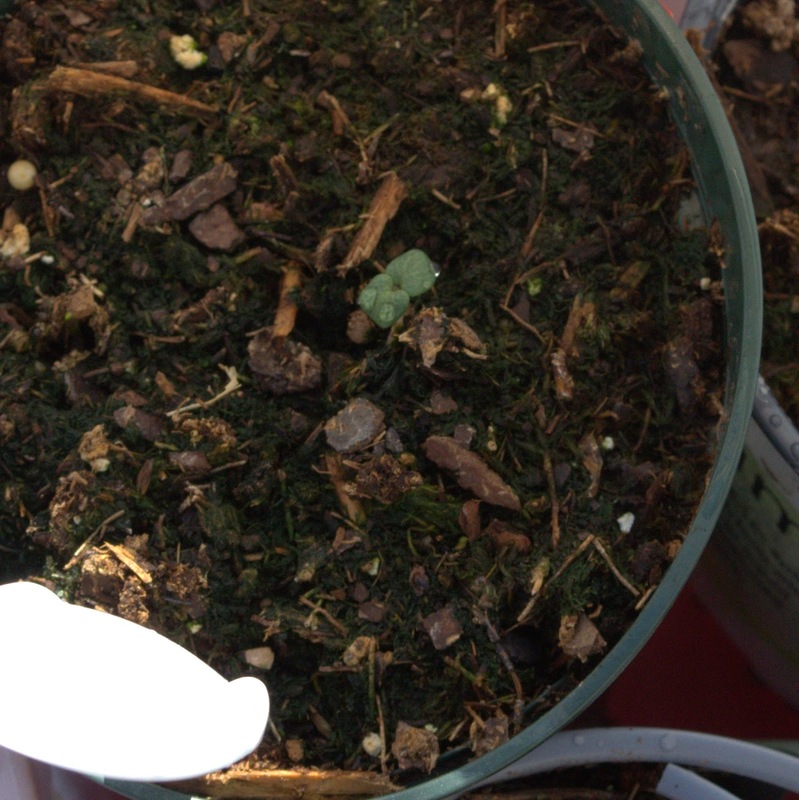 The spoon are used to keep the plastic off the surface of the dirt. You can also use straws, or sticks. 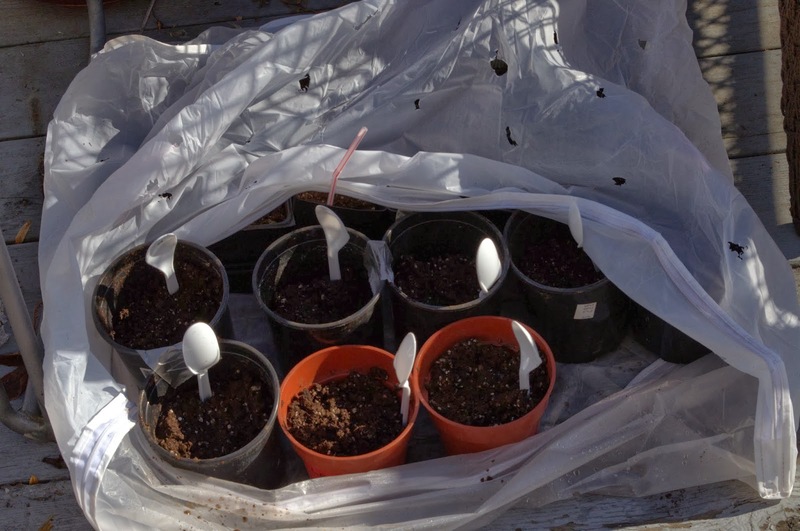 I use the spoons as plant markers when planting the plants. I write the name of the plant on the spoon part and bury into the ground. This keeps the ink from fading. 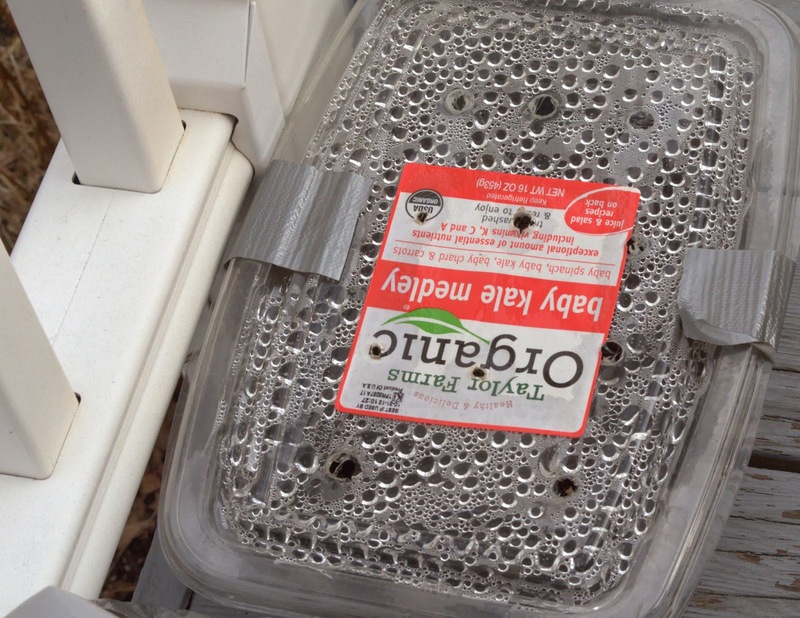 Here is a lettuce container I used for seeds. The condensation on the top is what you want to see. You will see condensation on your milk jugs too. 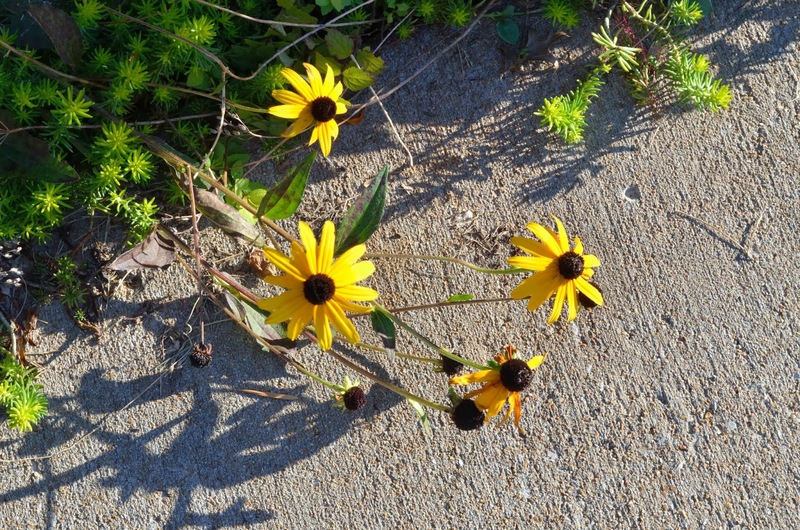 Some Black Eyed Susan from last year. Columbine that too 3 years to bloom! We are still experiencing snow in ice in the MidWest , but in my soap kitchen, Spring has arrived! 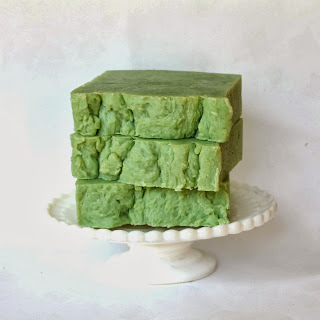 This green and yellow soap is made with 3 different pear fragrances. The scent is light and fresh and perfect for Spring! I made this soap just yesterday. 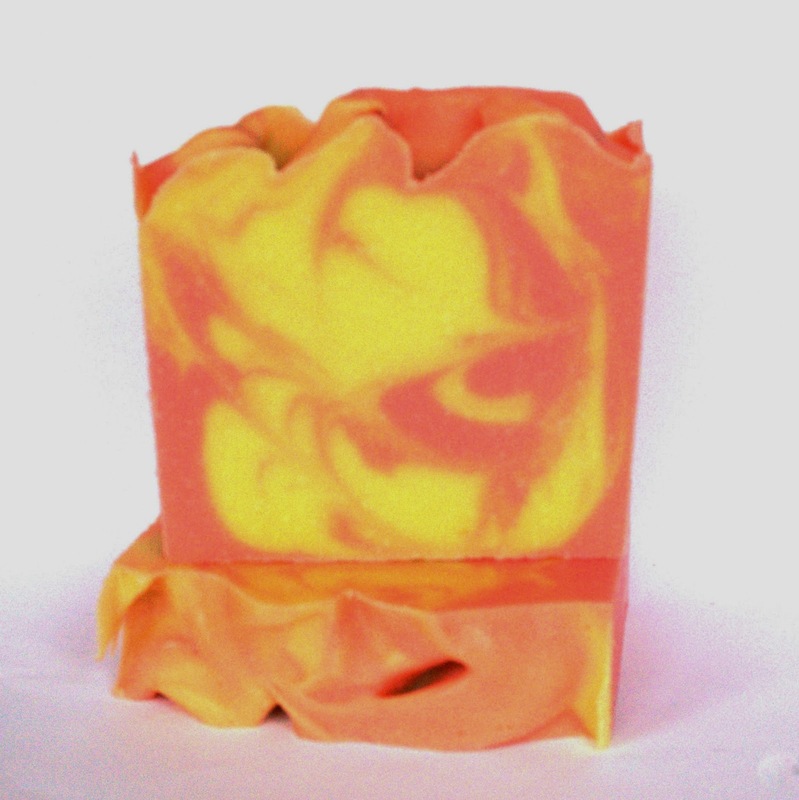 When I added the coloring, I thought this soap would be bright neon pink! The soap IS very pink, but not as bright as the batter looked! I think it came out perfect! I will be listing the Pear soap soon, along with Cucumber Mint. Cucumber Mint which was made with real pureed organic cucumber! 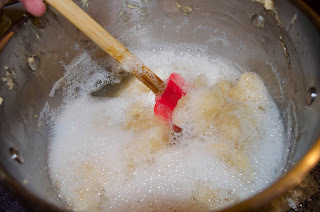 There are many ways to make liquid soap, so I thought I would share how I made mine. 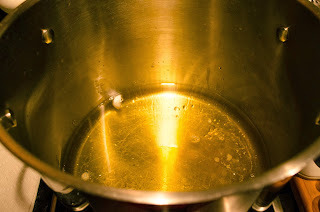 First, I add the hard and soft oils to a large stainless steel pot. 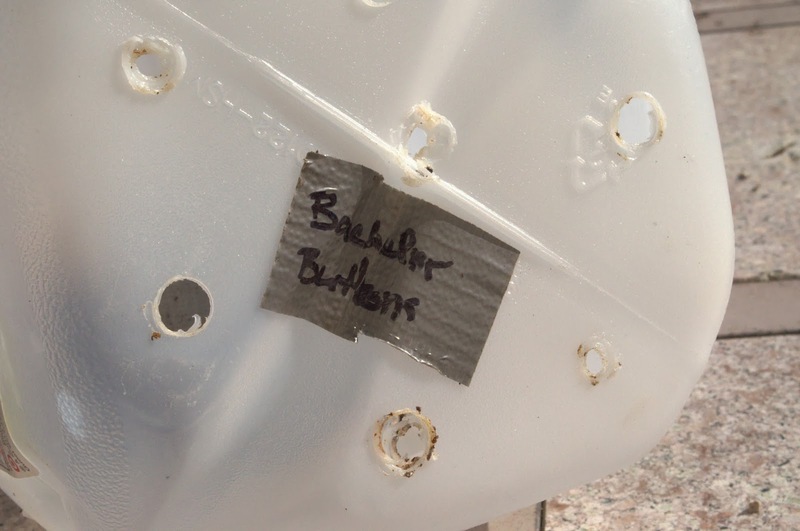 Make sure you are not using an aluminum pot. I can't remember how large this pot is, but I think it's a standard stock pot. While the oils are melting, I measure the potassium hydroxide. 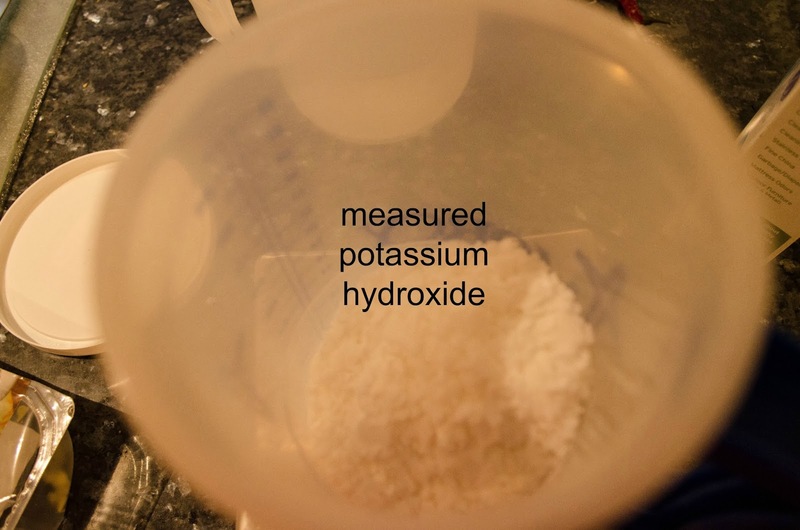 This comes in flakes and after measuring, it is added to distilled water. 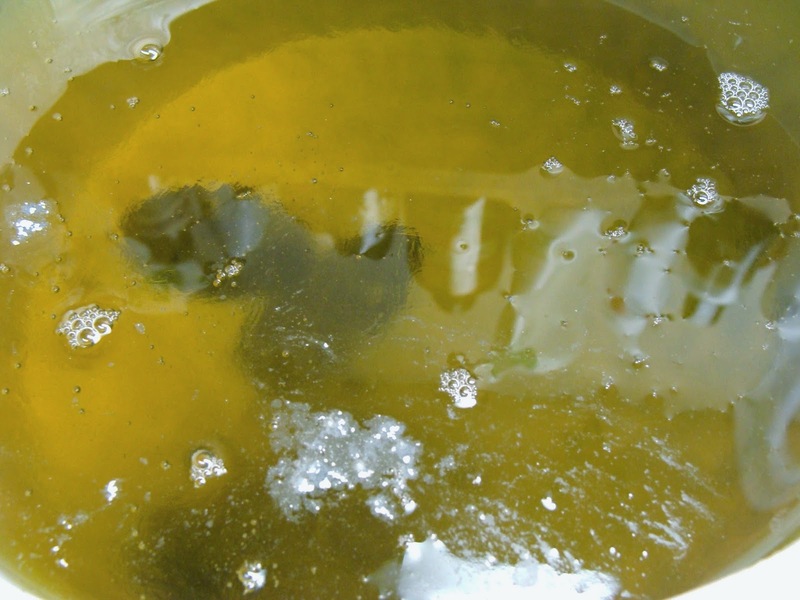 When the lye dissolves, it makes a loud "swishing" sound...sort of how a train sounds. 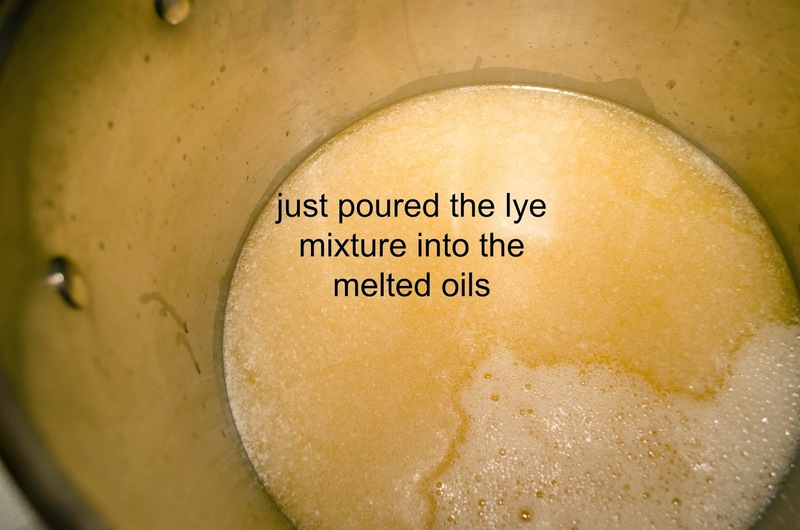 Right after mixing, the lye/water is added to the melted oils. I do not wait for the lye to cool down. This is what the mixture looks like right after adding the lye/water solution. 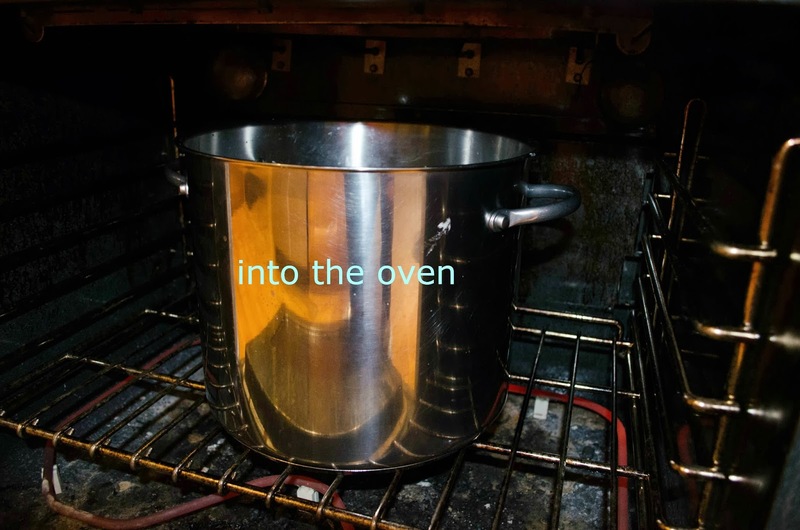 The pot is placed on low heat. I use a gas stove, so I use the simmer setting. 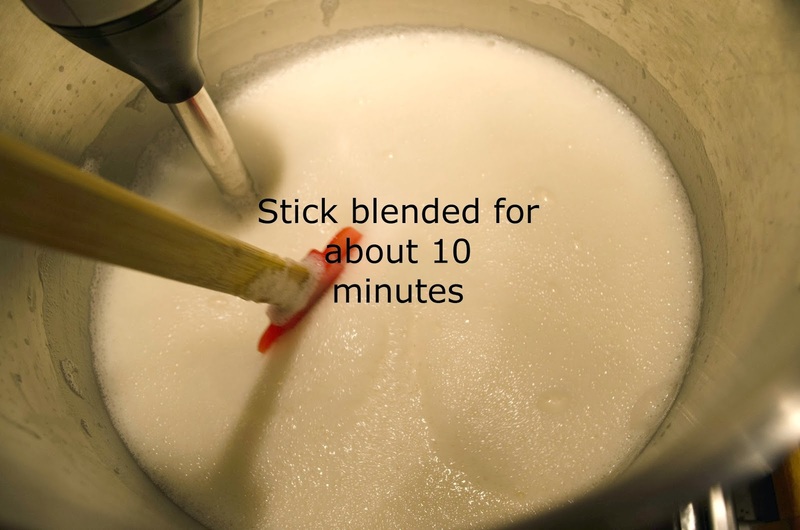 After stick blending for a minute, the mixture looks like thick milk. Now this is the tricky part. Stick blending speeds up the reaction between the lye and oil, but you have to be careful that the mixture doesn't overheat. If it does, it can volcano out of the pot..a big mess....don't ask me how I know! The trick is to stick blend the mixture while the pot is off the heat and hand stir when the pot is on the heat. I just rotate (on and off the heat) every min or so. Patience is the key! The mixture takes a long time to reach the next stage and how long depends on how much heat you use, and how long you use the stick blender. At this stage the mixture becomes thicker and is similar to thin pudding texture. Now, this is the fun part! 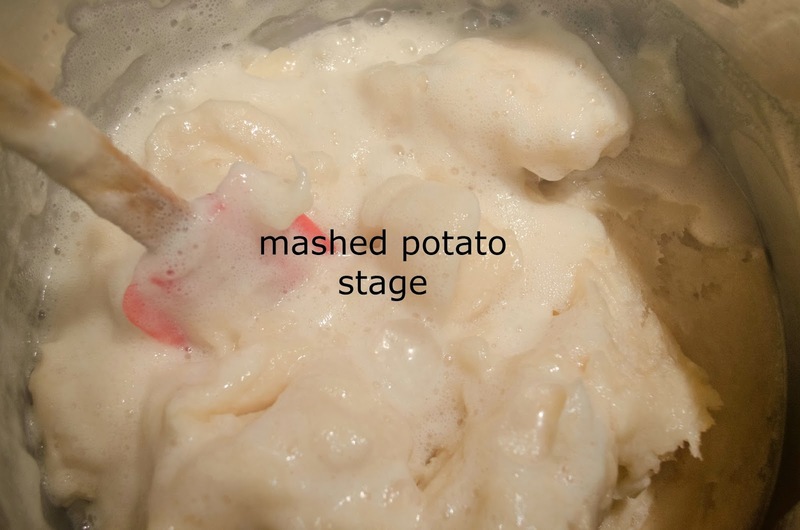 The "mashed potato" stage happens quickly! 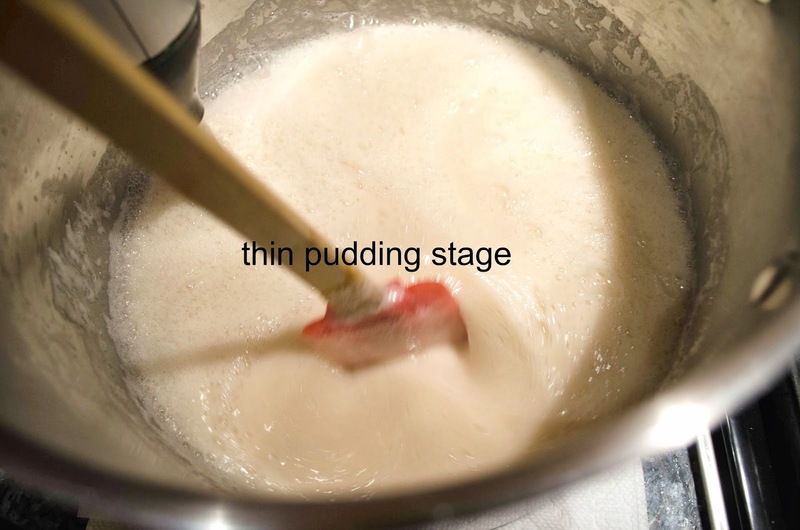 One second the mixture is thin pudding, and then it resembles mashed potatoes. Now, I stir and stir until I can't anymore. 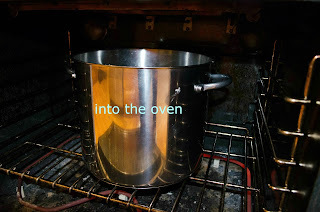 Next I place my pot (with the cover on) into the over, which is set at 200F. 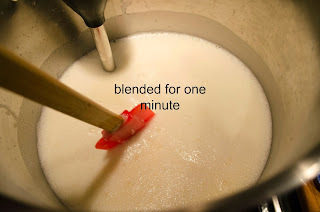 Every 30 minutes I check on the mixture (now soap paste). 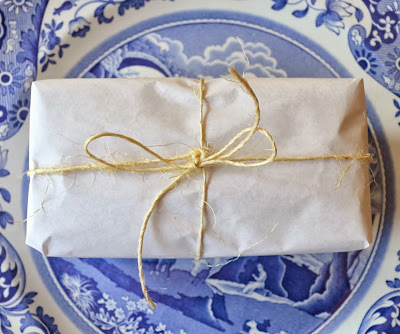 The paste will turn from white to opaque when it is finished. 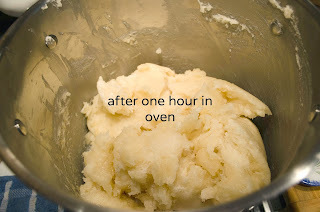 This process takes between 2 and 3 hours. 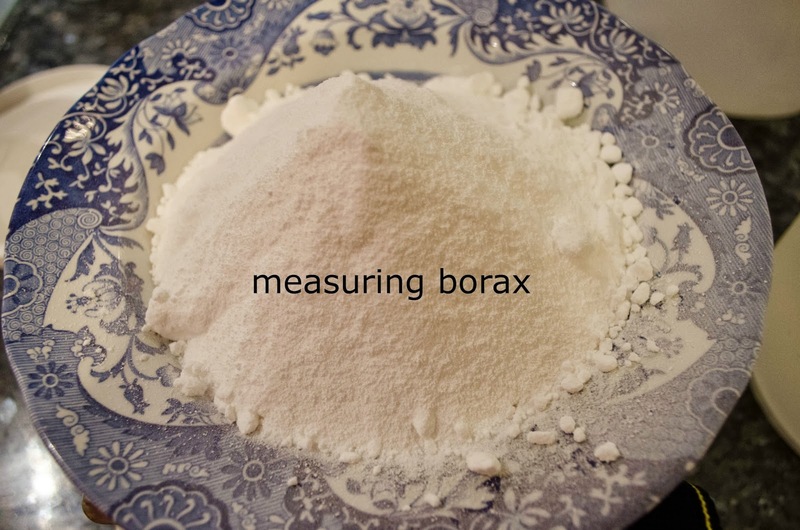 While I am waiting for the soap paste to finish, I measure out my Borax and distilled water. 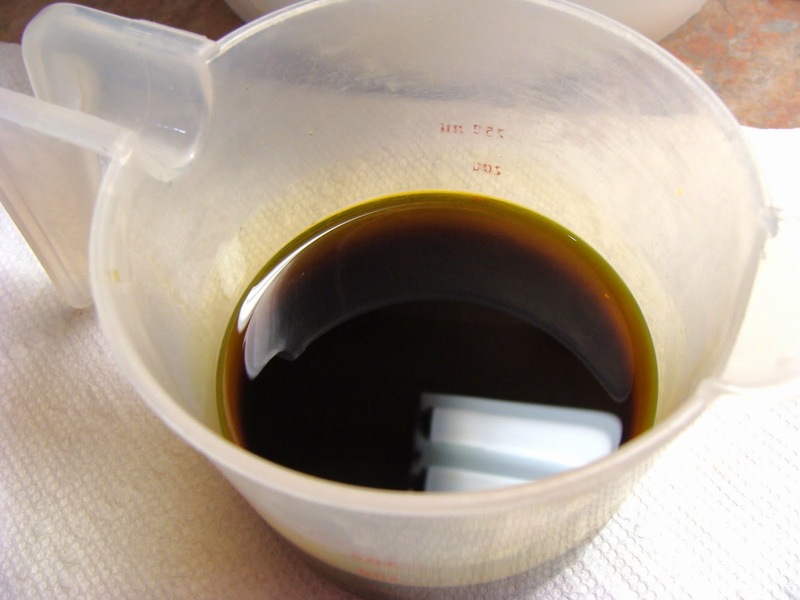 This solution will dilute the soap paste and help neutralize the soap paste. 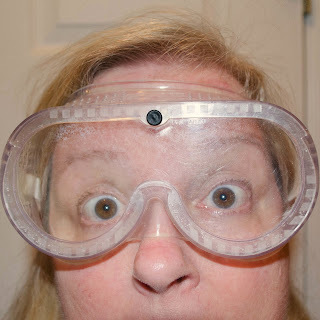 Don't forget your goggles! One tiny drop of lye in your eye, can blind you for life. The risk is just not worth it. Always, always, wear your goggles! Ok, I will step off my soap box. 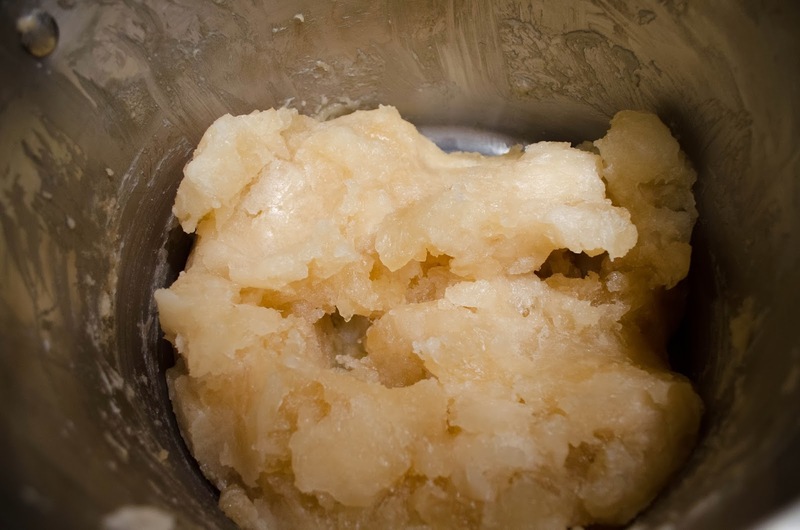 This is what the soap paste looks like after just an hour. It is still quite white. 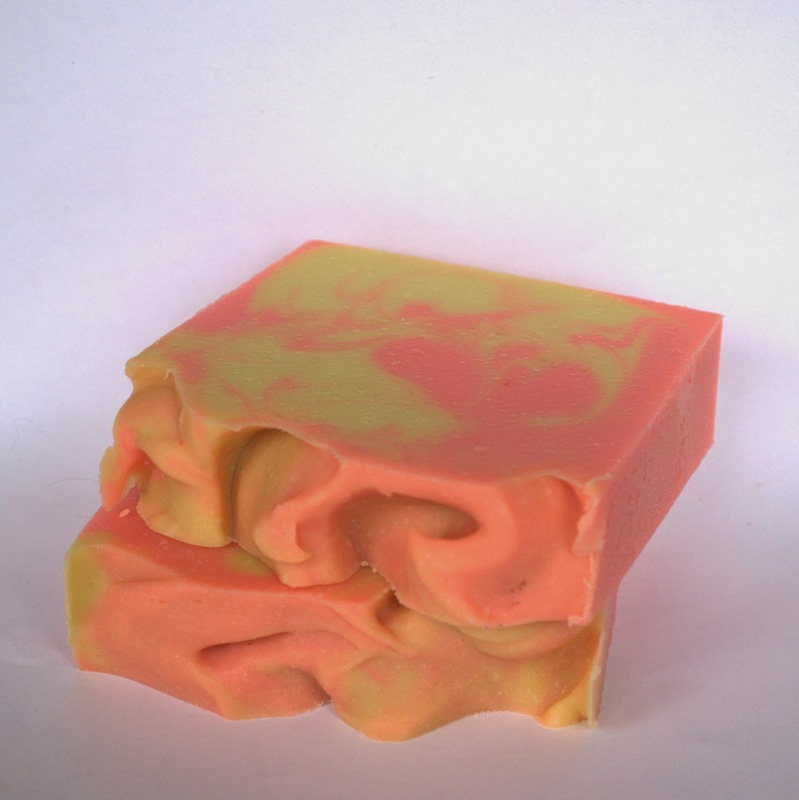 This is what the soap past looks like when finished. The paste should be the color of Vaseline, a shiny amber color. After boiling the distilled water, and dissolving the Borax in the water, I add the solution to the soap paste. This part is not a fun part. The paste has to dissolve into the water. This takes lots of stirring, and stirring, and stirring. I usually stir the pot, and come back every half hour and stir again. 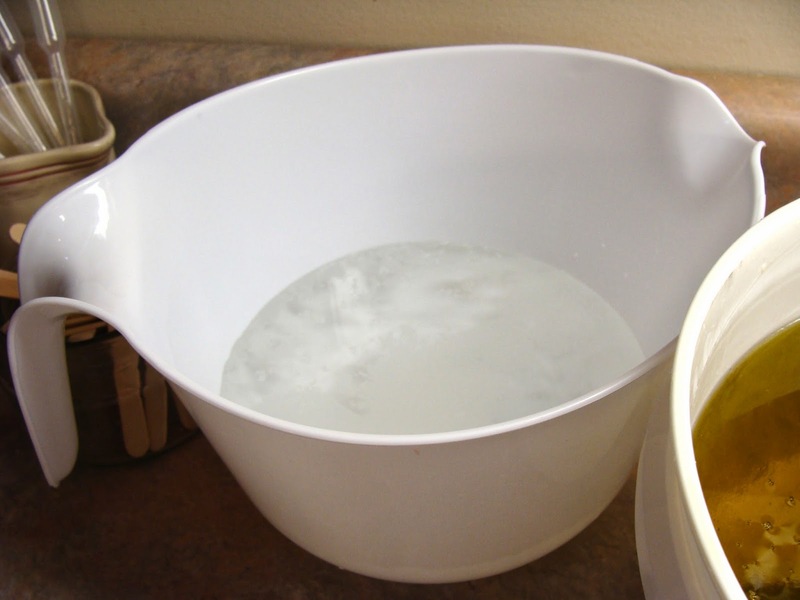 Keeping the lid on, and a towel over the pot, keeps the soap warm and easier to dilute. Did I mention you have to stir and stir and stir? After a few sessions of stirring, I put the lid on and wait until the next day. After a night of resting, the lumps are easier to dissolve. You can add fragrance when you add the Borax solution, but I like to keep mine unscented. I add the fragrance as the body wash is ordered. 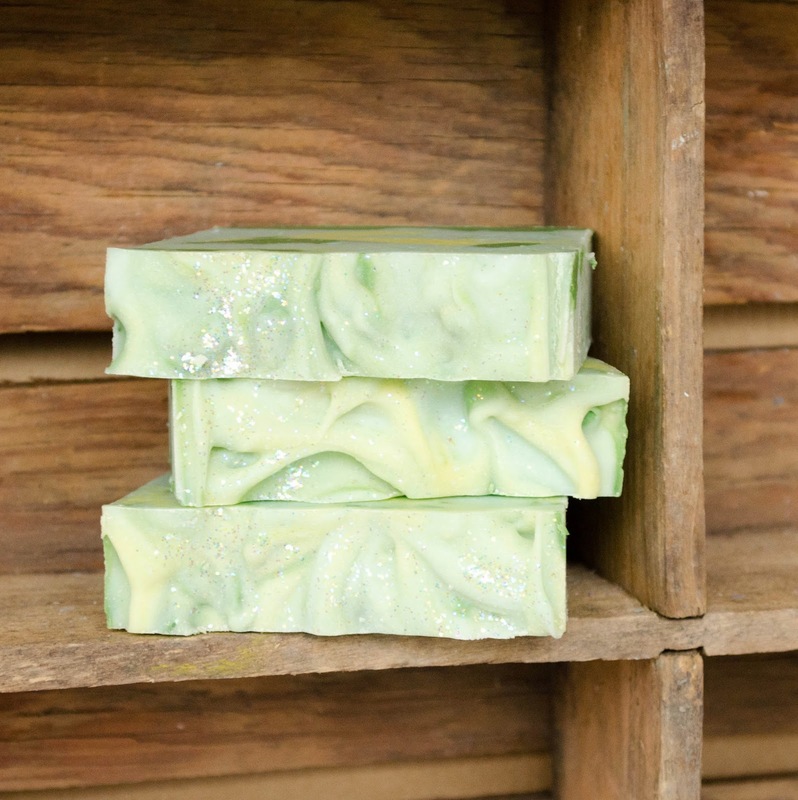 Adding fragrances and essential oils can change the density of the soap. Some will make the soap thicker, and some will thin the soap. I like to keep my liquid soap a little thick in case the fragrance thins when added. You can see the body wash in the above picture. It is a light amber color. 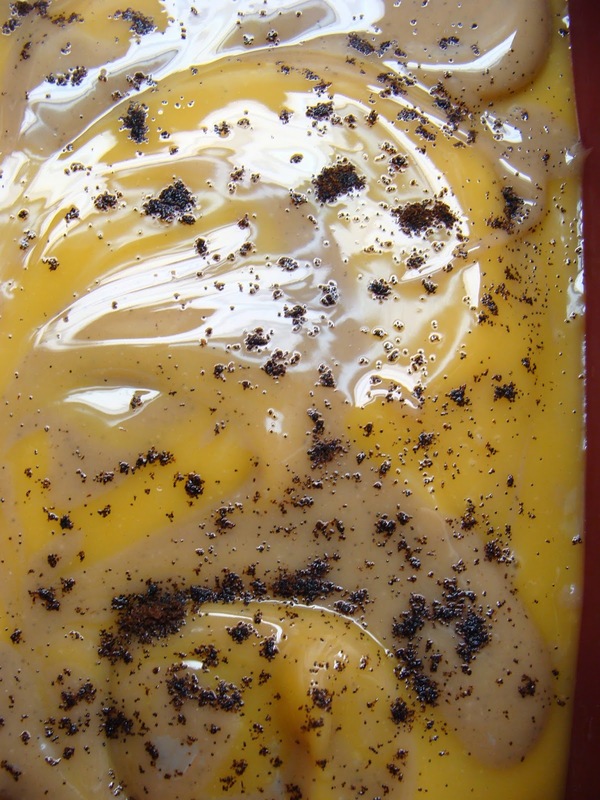 I don't color my soap, but when I add a fragrance that contains vanilla, the soap will turn a darker amber color. Making body wash/liquid soap is not hard, but it is time consuming. I find it very rewarding after it is all finished. My recipe makes 6 pounds of liquid soap, so I make a pretty large batch. I hope you enjoyed the process! 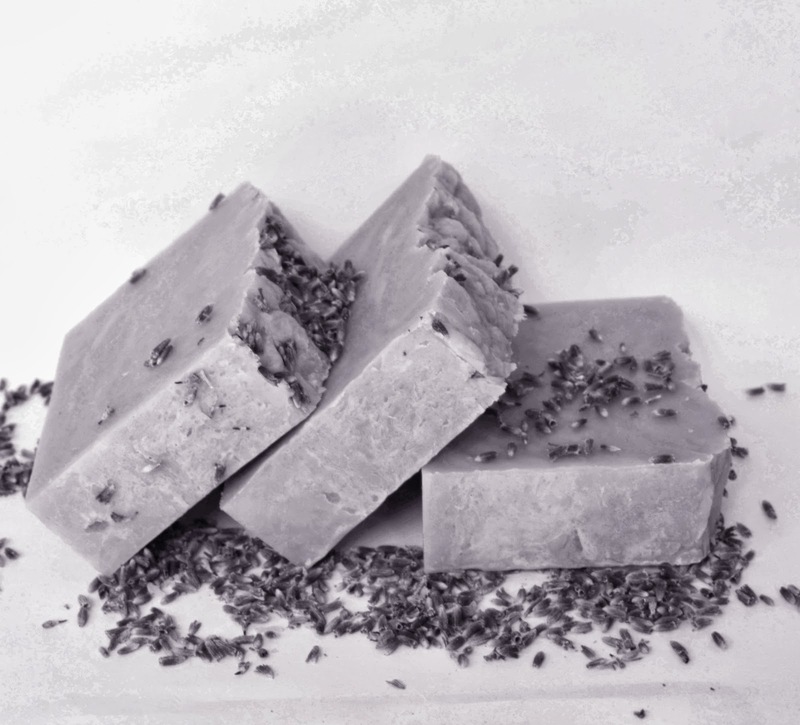 Handmade body wash is made with pure fresh oils, and doesn't contain any additives or chemicals like store bought soap. I have wanted a new camera for several years now, and I finally received a new one for my Birthday! It has many bells and whistles, which is fun, but it means I have to learn how to use all the bells and whistles! I tried my hand at taking pictures off the auto setting. We went to the Americana Music Awards in Nashville last month. I took this picture inside. I obviously need more time on the camera! I plan to use this camera for product pictures and videos for YouTube. Here are some pictures I have taken using the camera. I love how clear the pictures are. Now I just need to work on lighting and staging! I have been quite busy lately. I am placing my product in another St. Louis retail shop, and between filling this shop, and keeping my other retail locations stocked, along with my Etsy shop, I can't seem to catch up! I made quite a few hot process soap batches so I could stock up on soap. 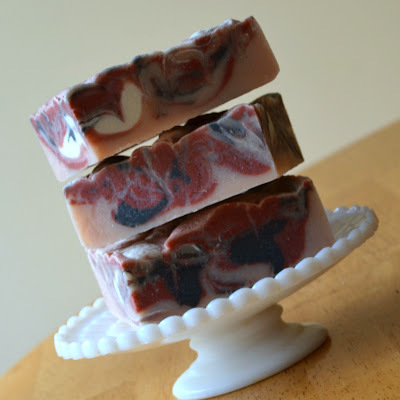 When everything slows down, I will get back to making my favorite cold process soaps! 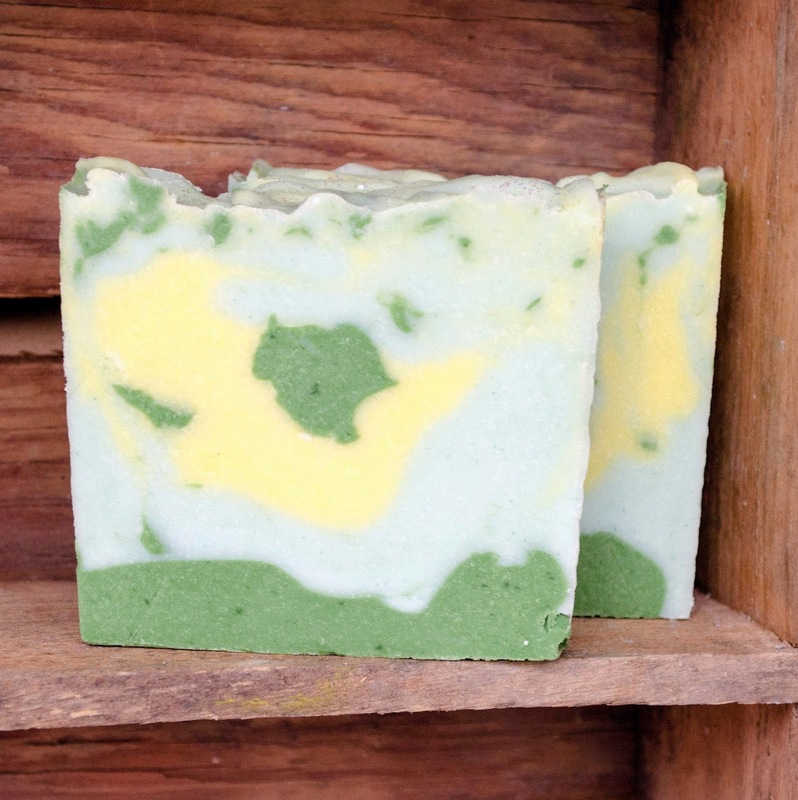 The top green soap is Eucalyptus Mint and the bottom soap is French Blend (lavender, tea tree, and clove). They don't look as pretty, but they sure smell good!